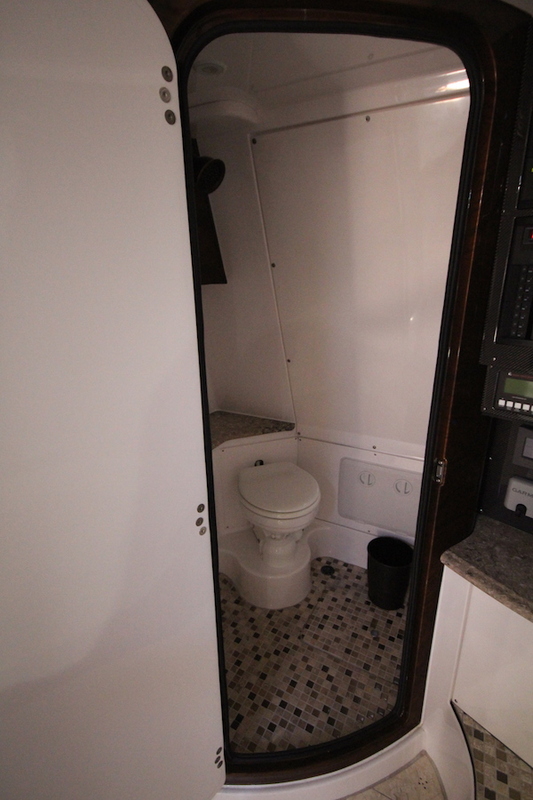 CABIN: Central cabin with double berth, galley, lounge and separate enclosed electric head and shower. A/C & generator optional. 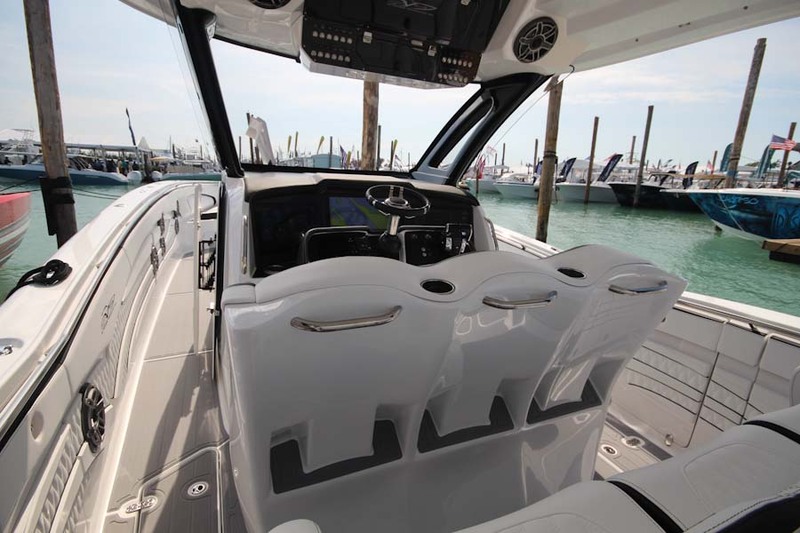 If you are looking for the ultimate in a center console over 50’, then look no further than the MTI 57-V. 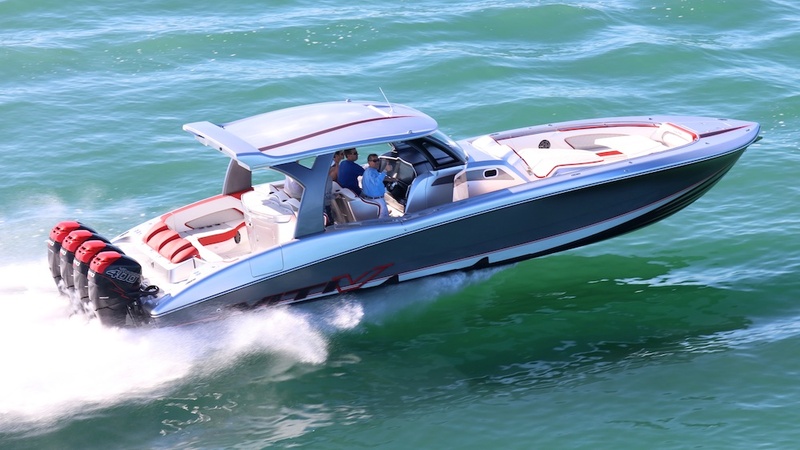 Taking styling and feature cues from the successful 42-V, the 57 has no equal when compared to any boat in this size range. 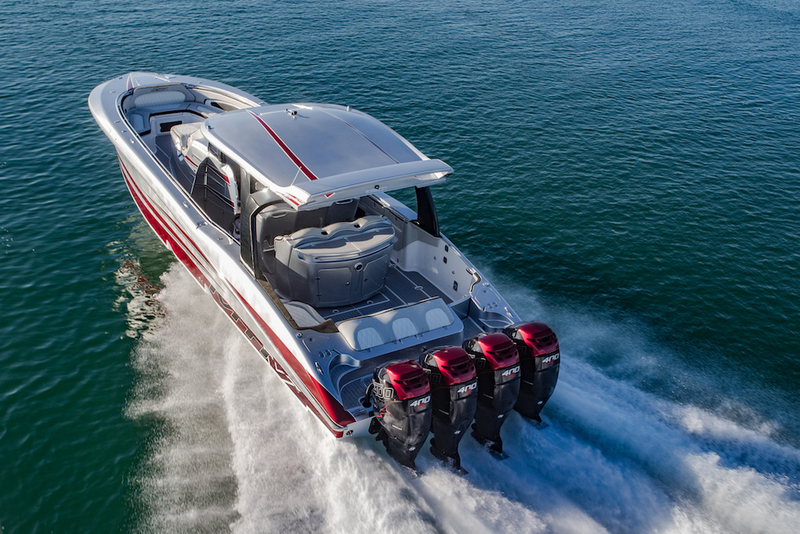 Despite its length and thanks to the patented “Slot V” hull design, the 57 still feels sporty and runs fast making it the performance leader amongst any other. 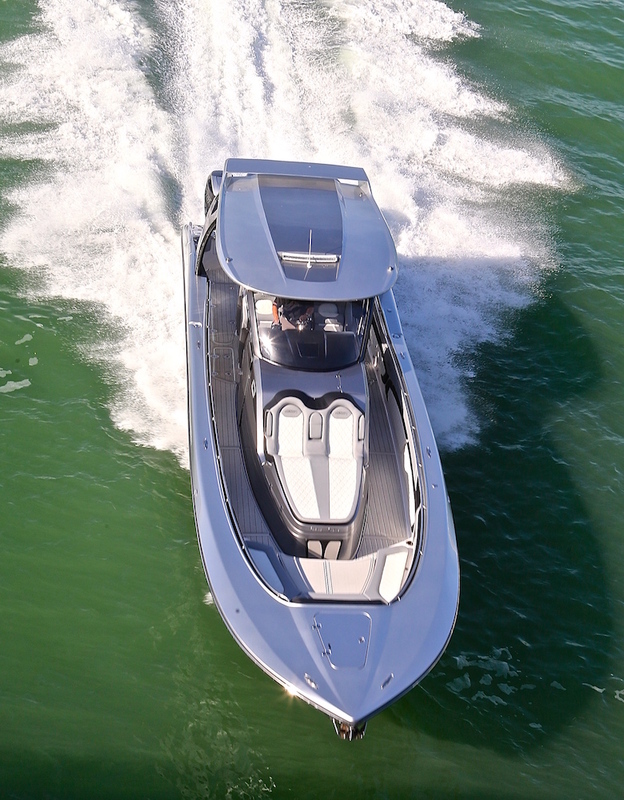 Push the throttles forward and there is little to no bow rise while effortlessly reaching cruising speeds in seconds. 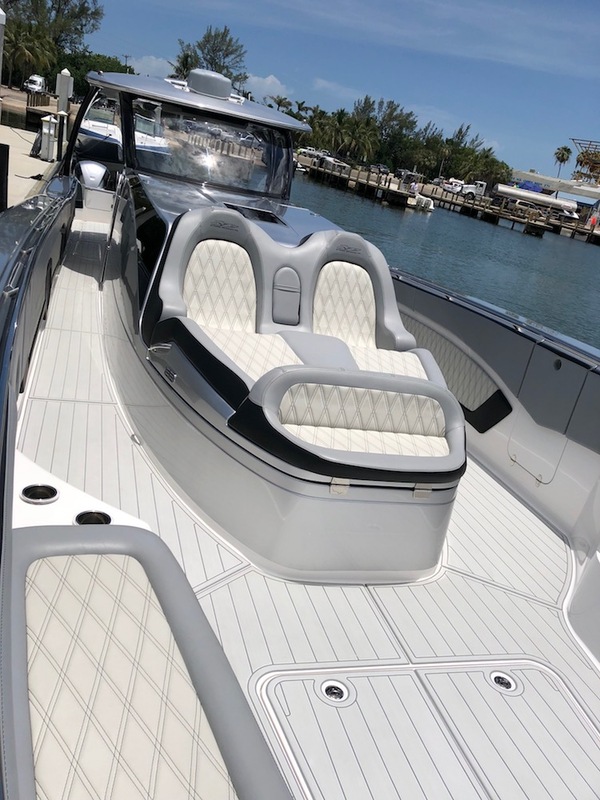 When the seas kick up the 57 carves through the waves in a knife- like manner keeping you and your passengers comfortable and dry. The cockpit interior space is immense. Two rows of 3 across bolster seats with a large amount of room behind. 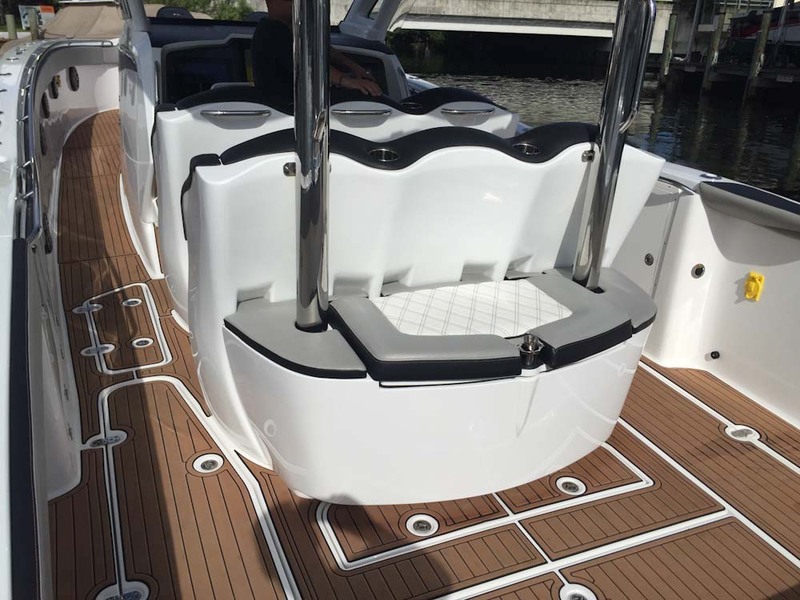 The aft area has a large bench or even an optional L-Shaped seat. 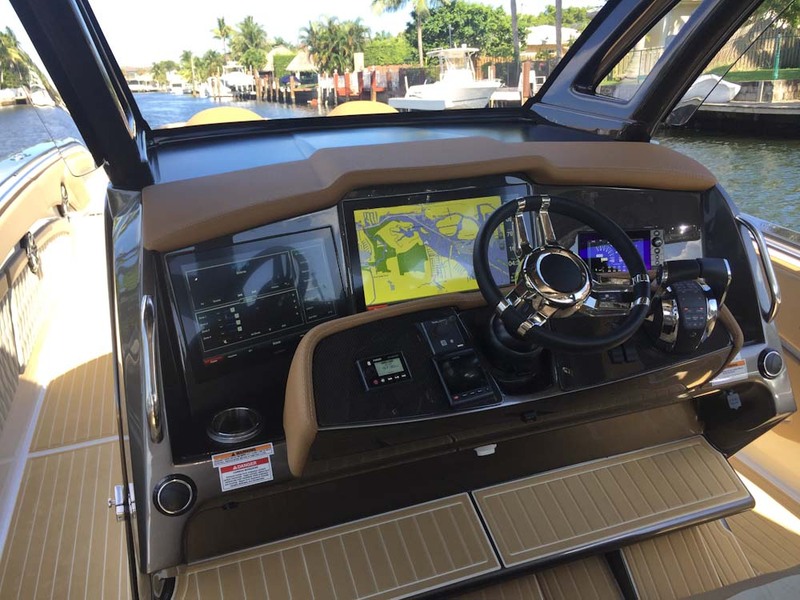 A number of options are available to configure the cockpit for your needs. 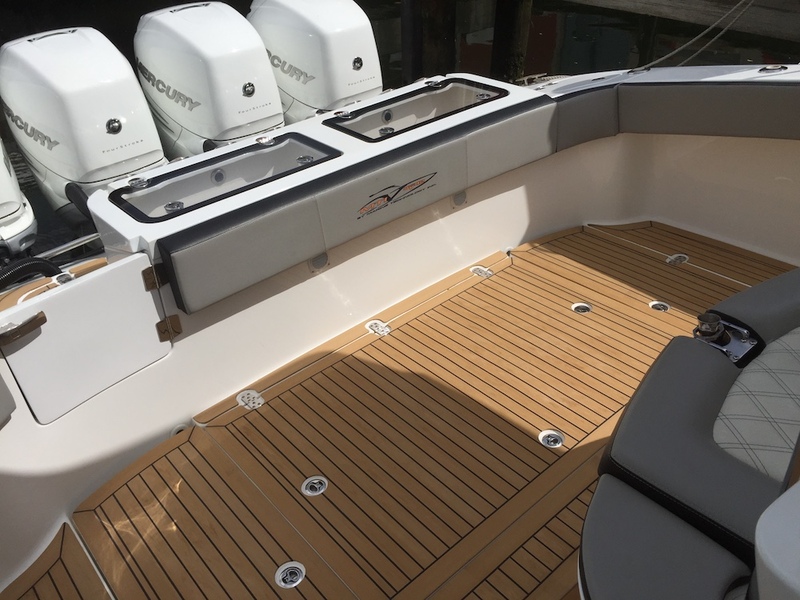 Going forward there’s a large contoured sun lounge with storage below and forward bow seating with comfortable aft facing lounges. 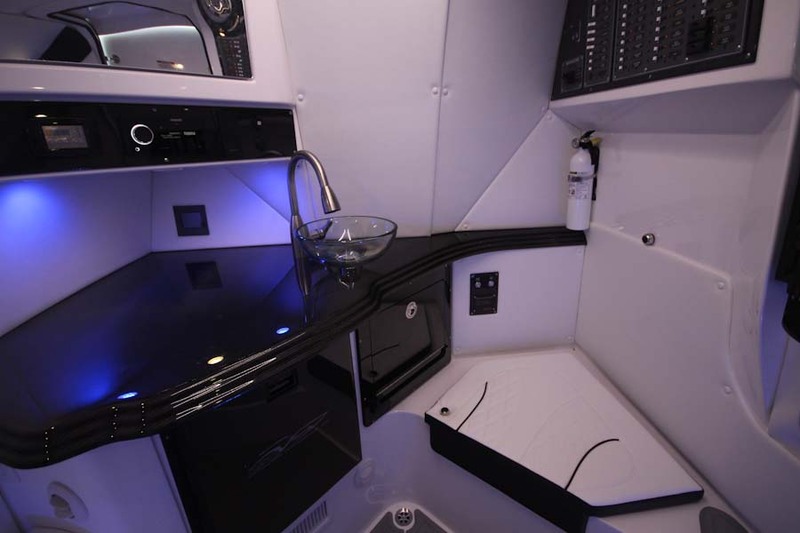 Below decks there’s a galley and storage cabinets along with a seating area. 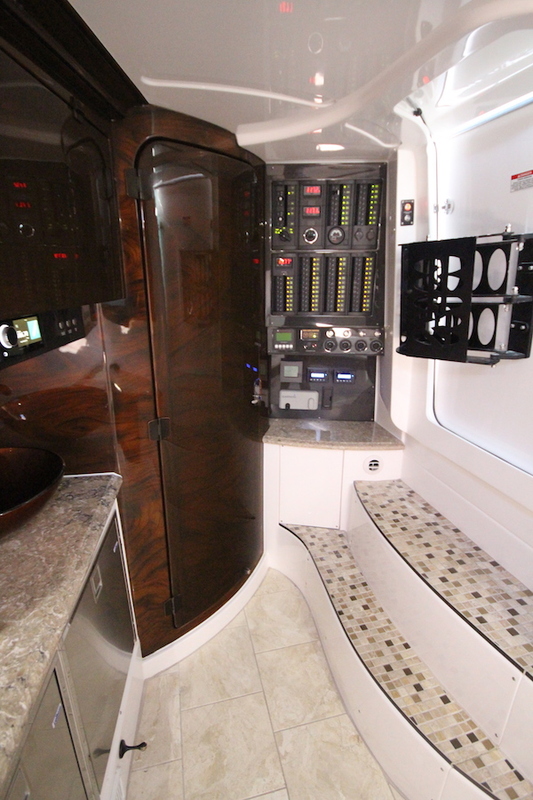 Going aft there is a stand- up enclosed head and shower. 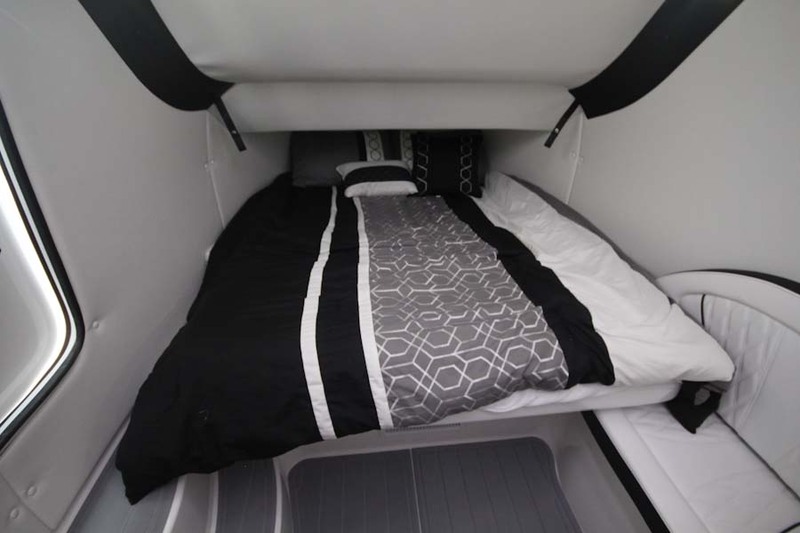 Forward is a large queen- sized berth. 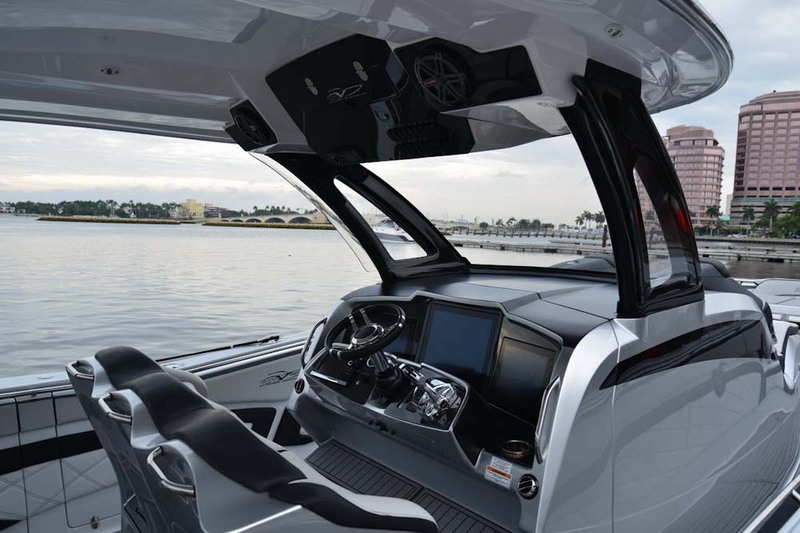 All of which can make for comfortable nights out on the water. 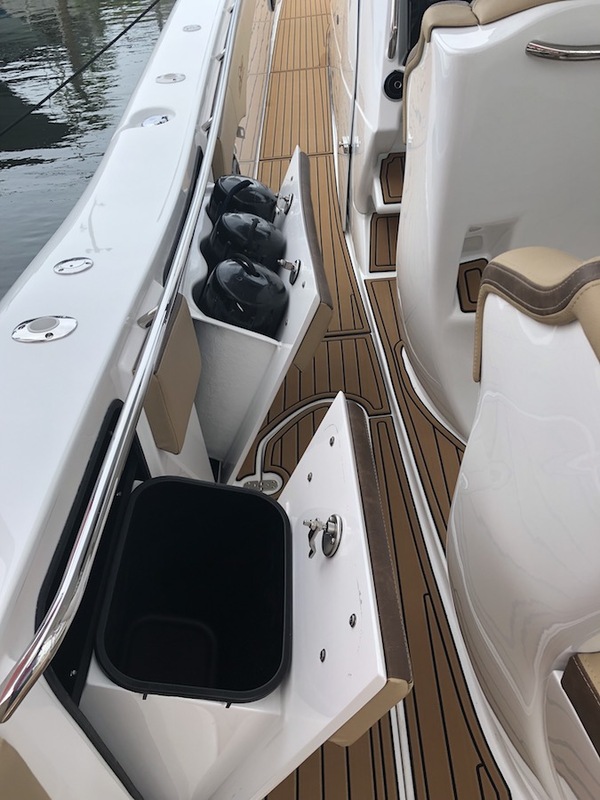 Standard Equipment Included with Every Build As with all MTI V’s the 57 can be built to suit any and all of your boating needs. 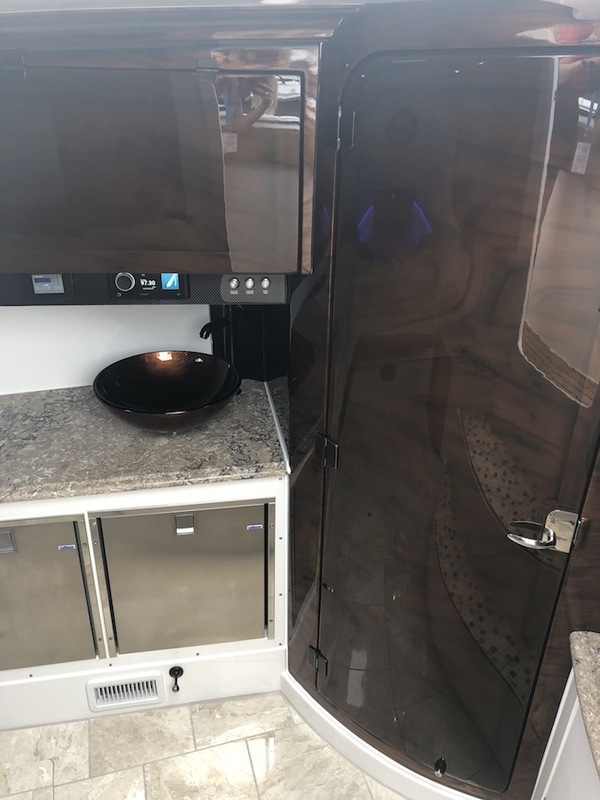 EPA compliant fuel system, 468 Gal. 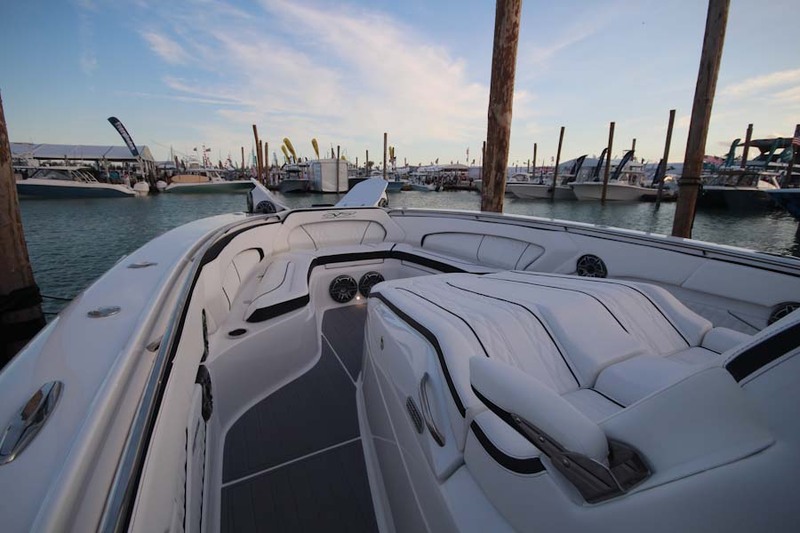 Revolutionary Advanced Design Every MTI is custom built to your specifications. 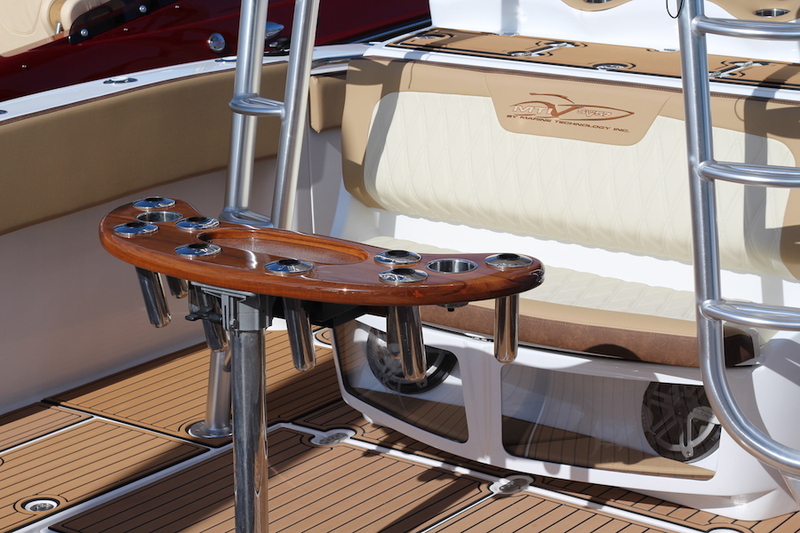 Starting with our available options, you can outfit the boat to your boating lifestyle. 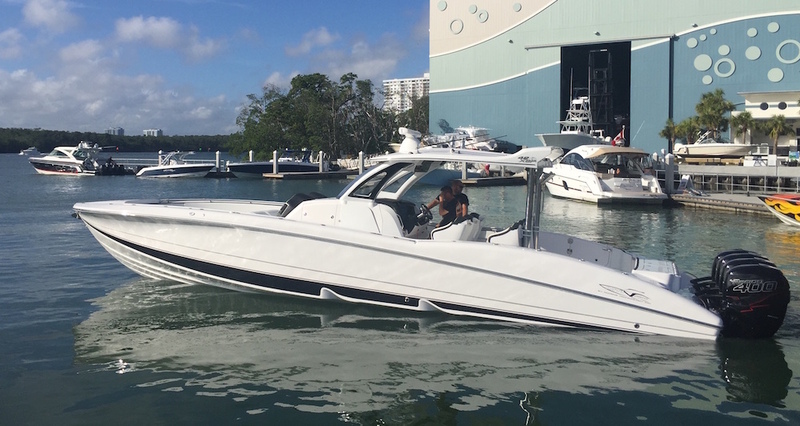 No matter how you boat or where, the MTI V can be tailored to meet or exceed your needs. 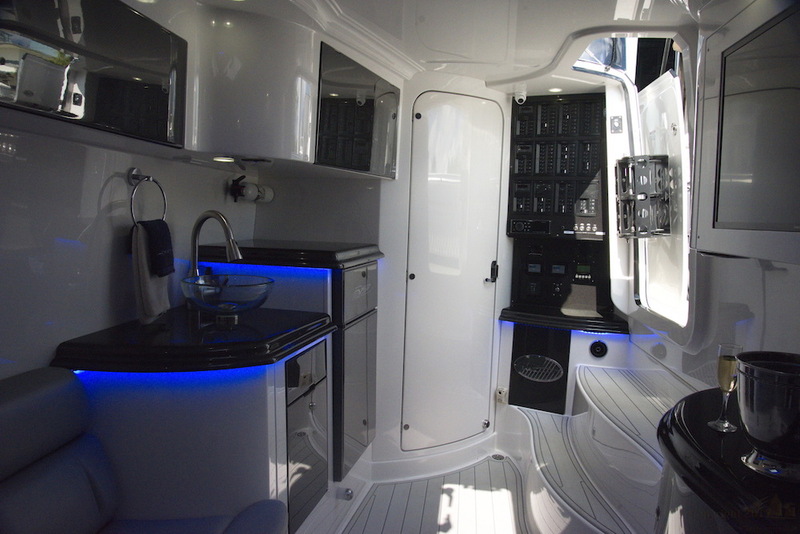 From there the exterior colors and graphics are only limited to your imagination. 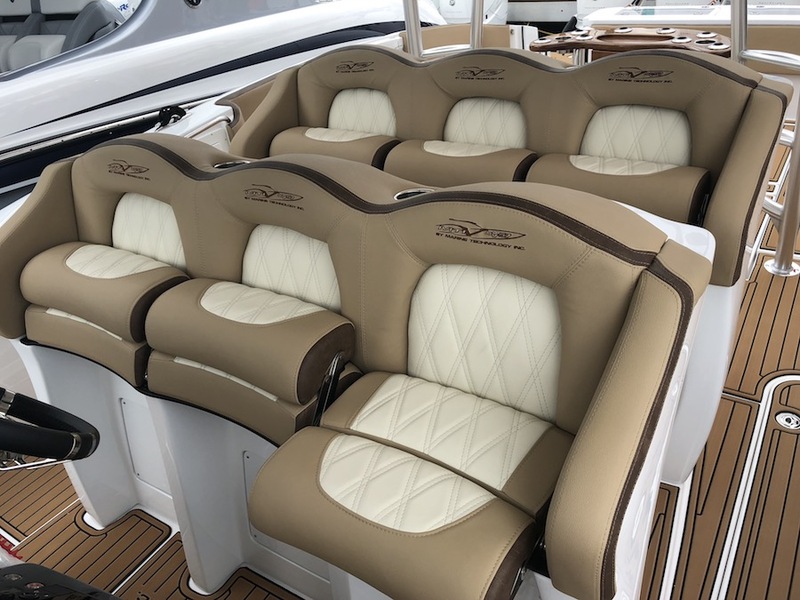 You can choose your interior seating options and fabrics from a wide array of the finest marine fabrics available. Our expert in-house designers are available to guide you through the entire process. Pristine Manufacturing Process The MTI-V is an epoxy, foam core, and post cured, all built with true vacuum bagging processes. Very few other builders actually vacuum bag their entire laminate. Most only vacuum bag their core to the outer laminate. 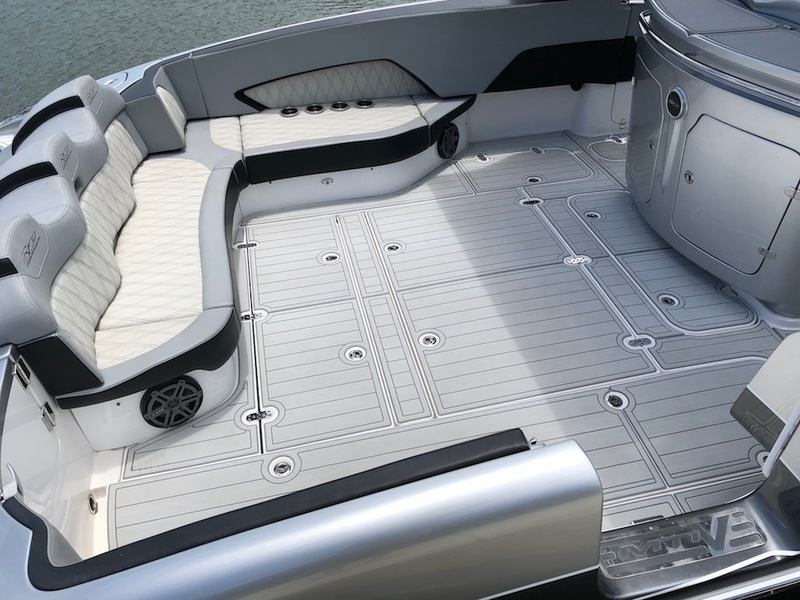 We vacuum bag the entire laminate and foam core to achieve the proper resin to glass ratios which provide strength and weight control. Excess resin does not make a boat stronger. Only the finest materials are used throughout our lamination process. Epoxy resin is used due to its strength and longevity. 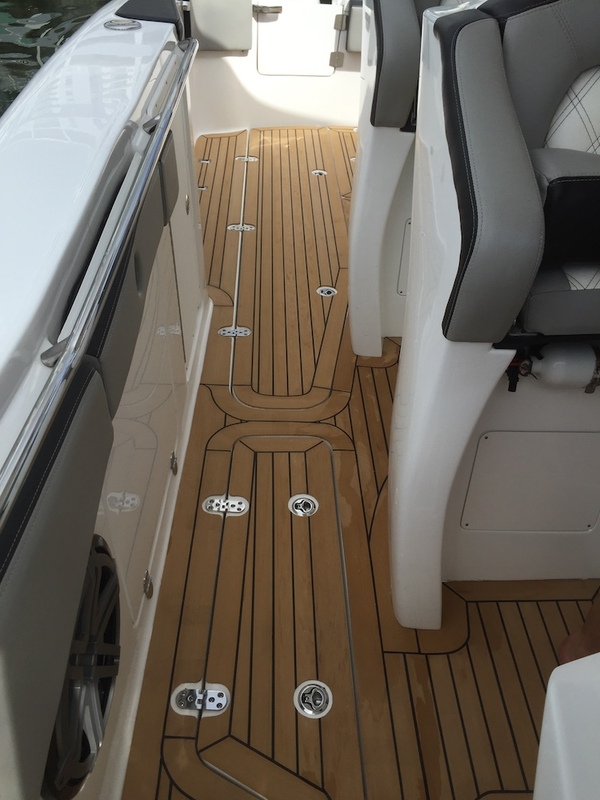 Epoxy is not as easy to work with, it takes more time to cure, and raw costs are more than GP or Vinylester Resins. E-Glass and Kevlar are the primary fabrics used. We also use carbon fiber on weight sensitive components, or even on the entire build if specified by our client. Strength comes from using the right materials with the right techniques in an engineered manner. 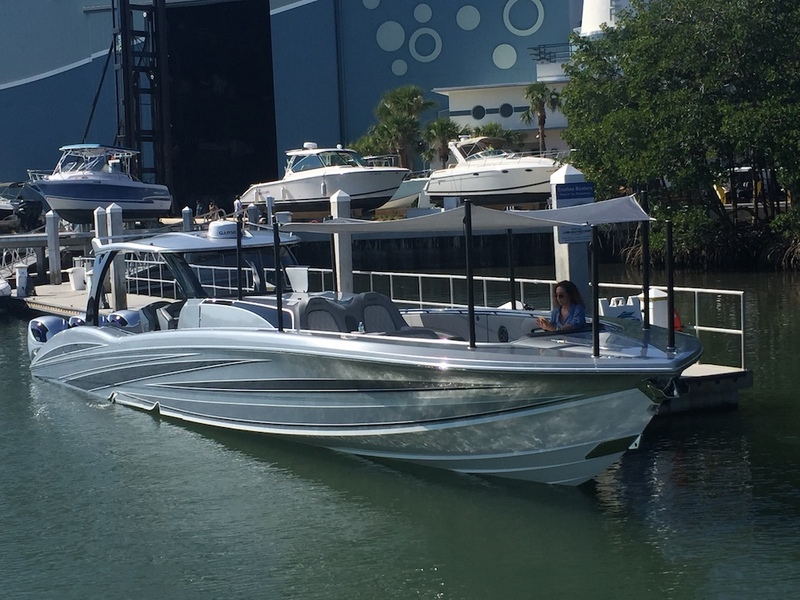 The MTI-V utilizes foam coring (no wood) in the hull bottom, sides, transom and stringers. 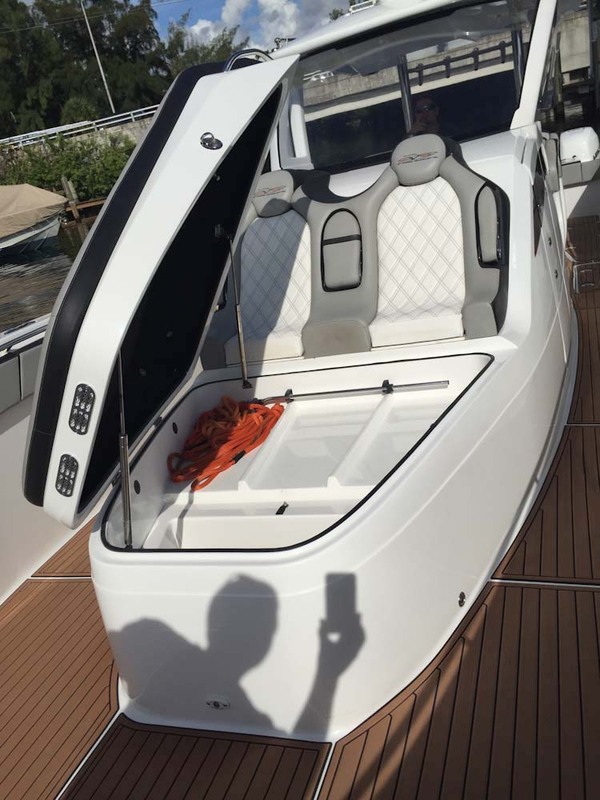 Many other boats are built minimal or even without core in the bottom. The cost of materials and labor are much higher with these techniques. 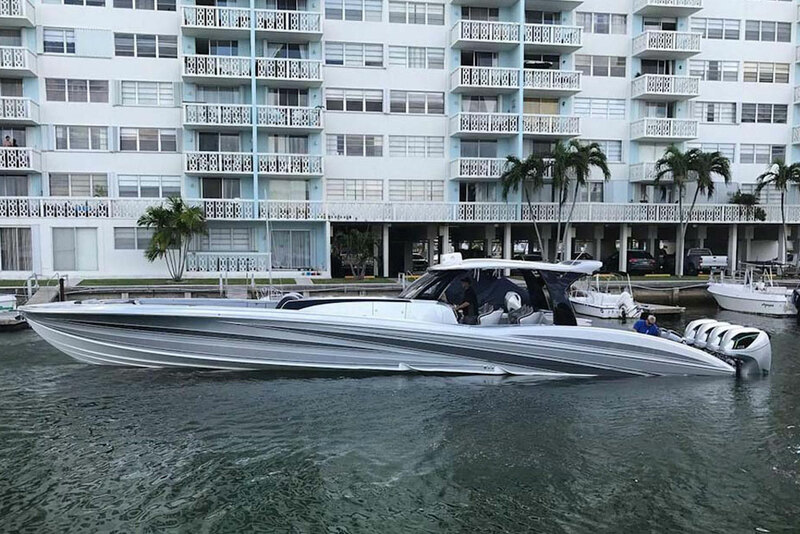 This may sound excessive for a pleasure boat application, but the result is a boat that is lighter, stronger, and faster. 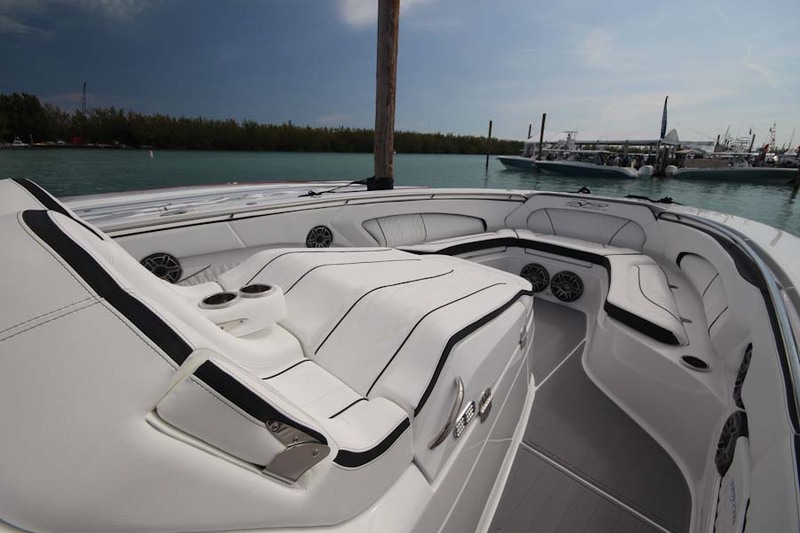 The boat is so solid that it must be experienced to fully understand the difference. 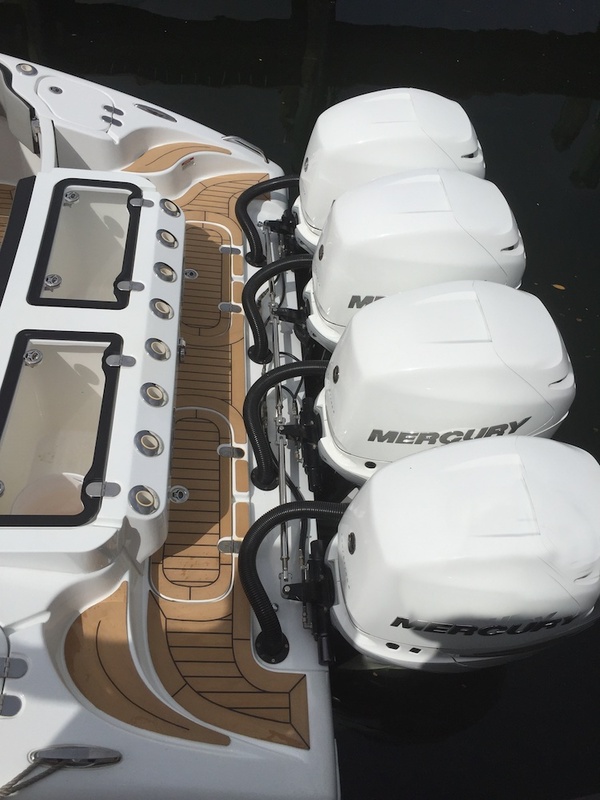 World’s Best Outboard Motors Our MTI-V Center Consoles come with the industry’s best high performance outboard engines. 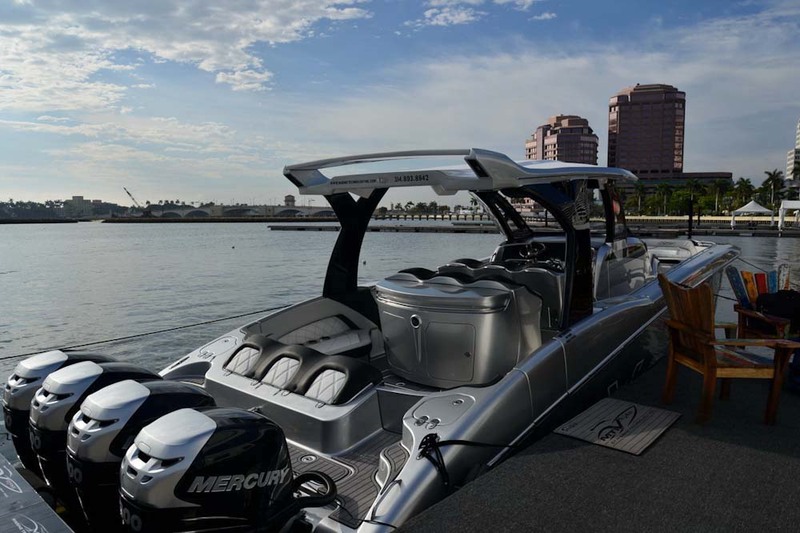 Our most popular package is the Mercury Marine 400R Verado triple or quad system. 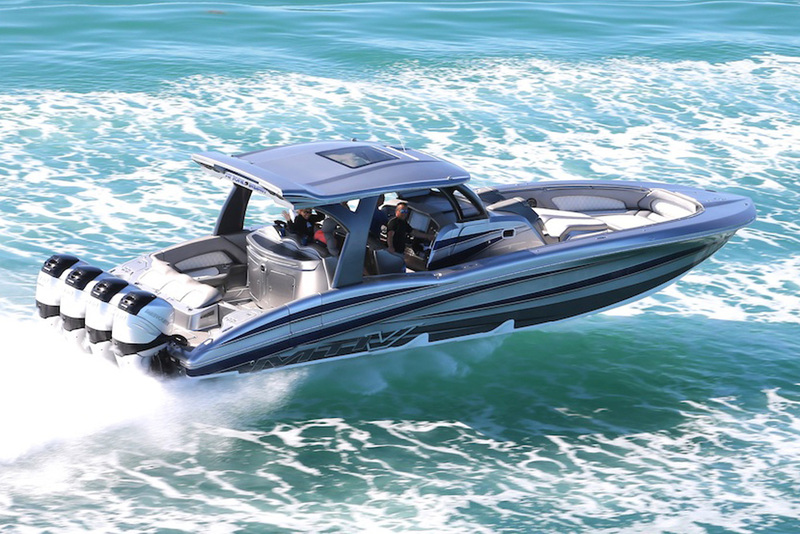 There is plenty of power and performance for your pleasure boating or professional fishing needs. 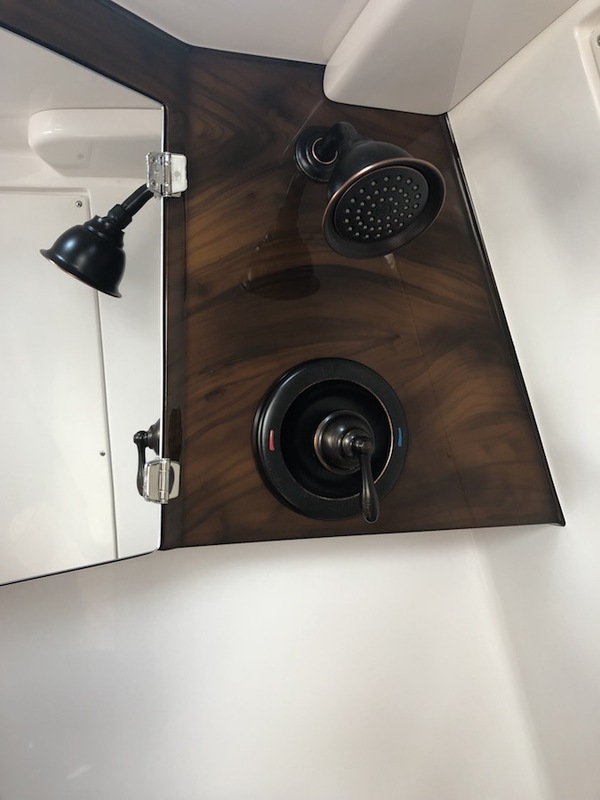 Upgrades and Additional Options MTI’s allow for so many upgrades and additional options to your MTI. 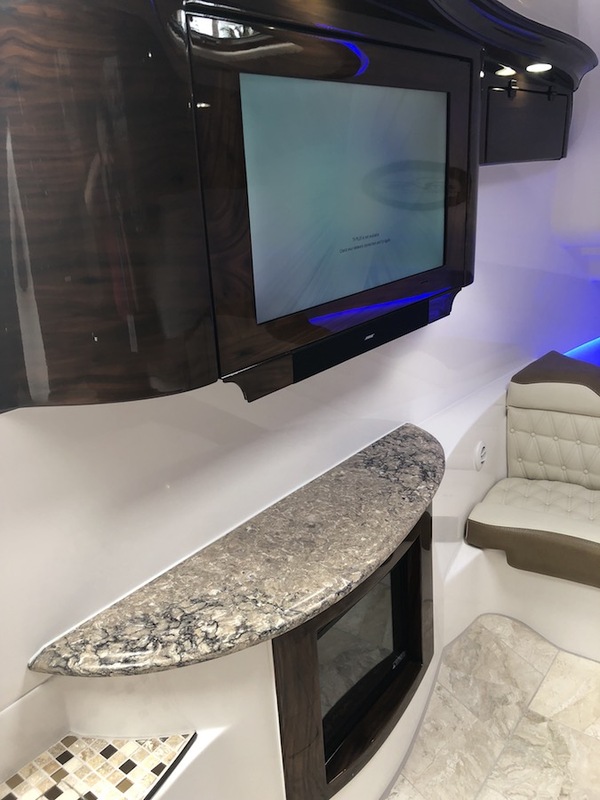 See all the different features that can be added to your Vee to give you that like home comfort feeling. Inverter – converts 12V to 110V power. 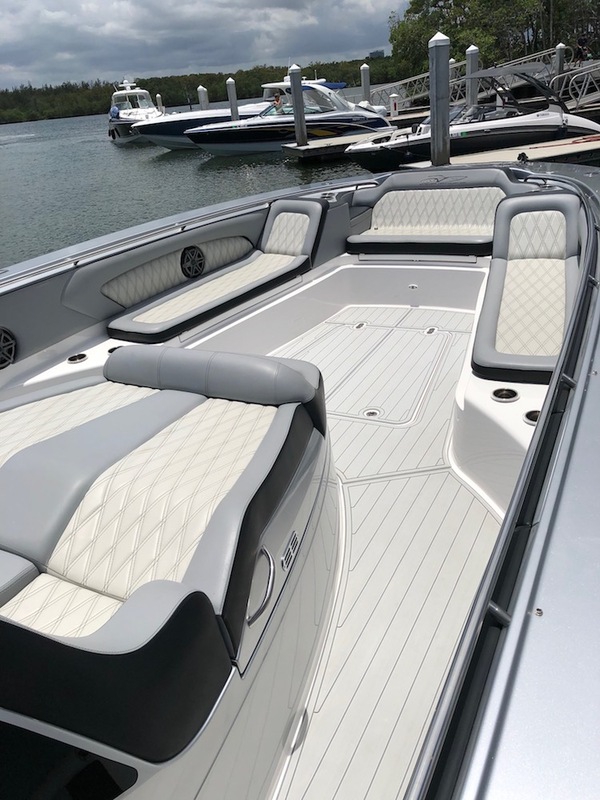 Custom Built MTI V-Bottom Boats The 57 V XSF Brings you all of the features and performance found in the pleasure version but geared more toward the serious angler. 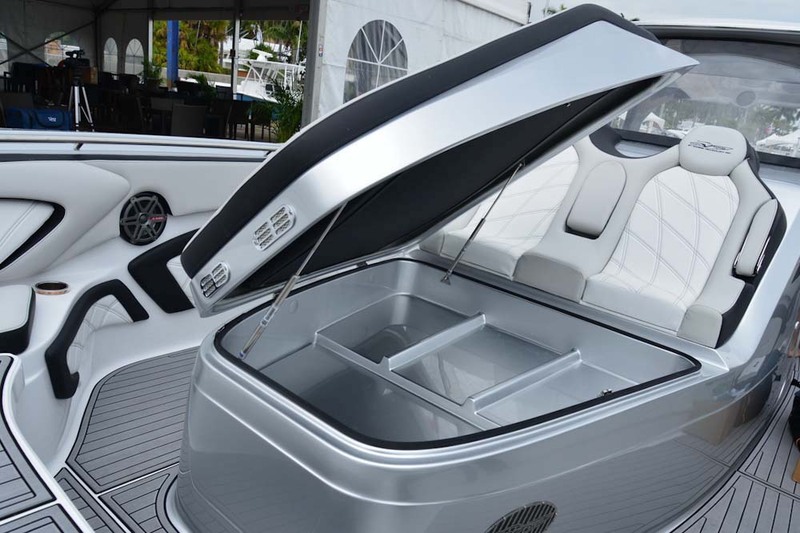 The T-top is shortened and outer legs relocated to center to allow more open fish fighting cockpit space. The rear bench has been removed to make room for the optional dual 45 gallon live wells. 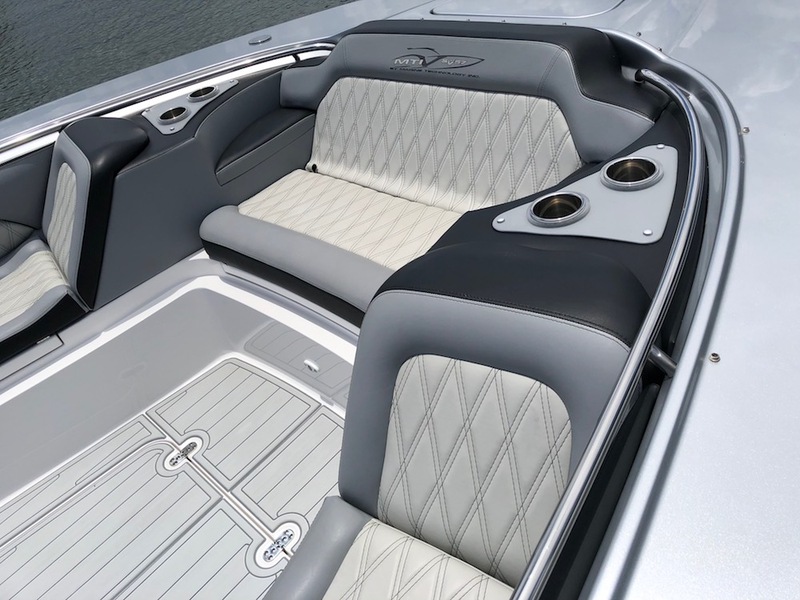 For even more fishing space, you can delete the forward bow seating. 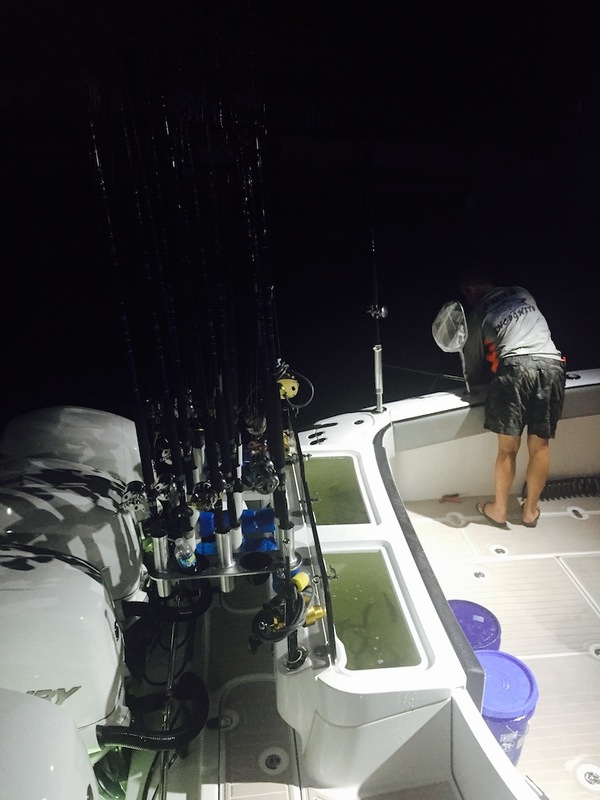 Bring us your list of ideas and we can build the ultimate offshore fishing platform for you. 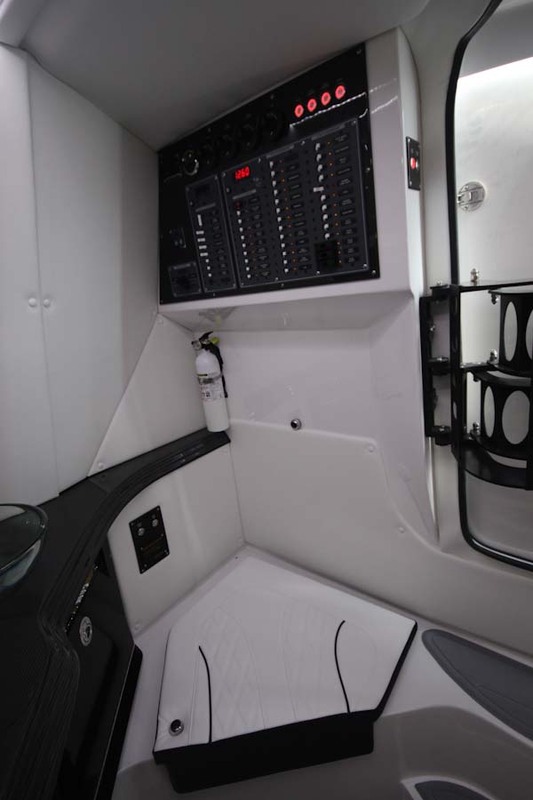 CABIN: Central cabin with double berth, lounge and concealed head enclosure with seat. A/C & generator optional. 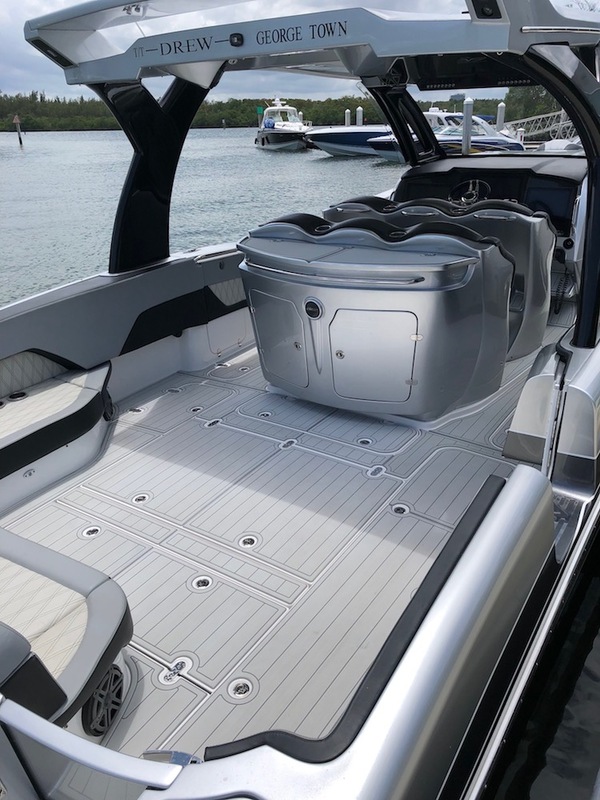 The MTI-V’s offer the performance, comfort and customization for those that demand only the very best in a center console. 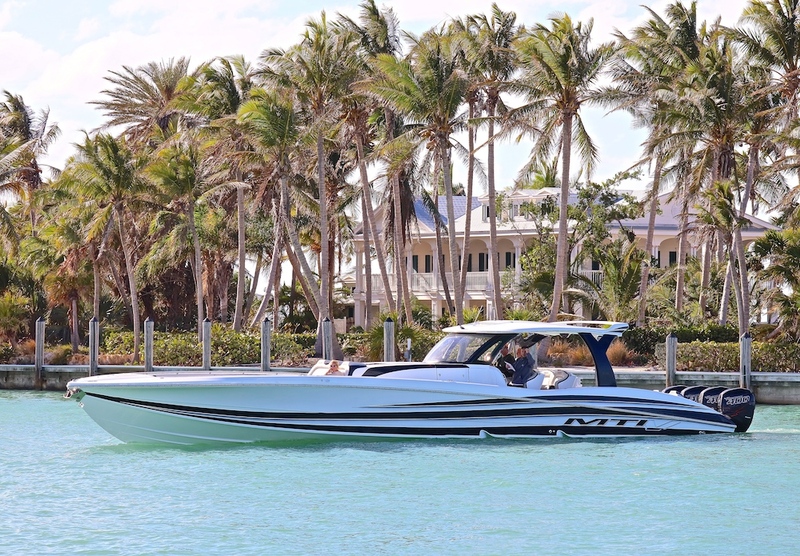 Each MTI-V is custom built to suit your needs and boating lifestyle. 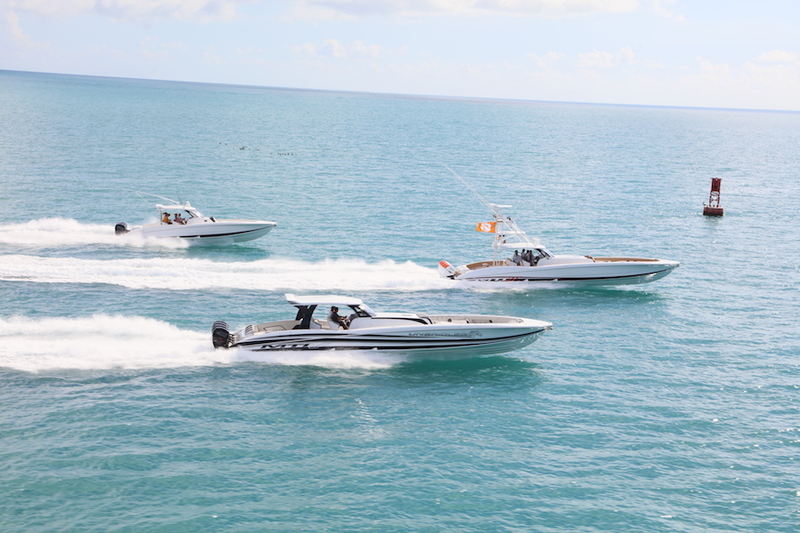 We cater to all aspects of performance, cruising, family, luxury, fishing or a tender to a yacht. 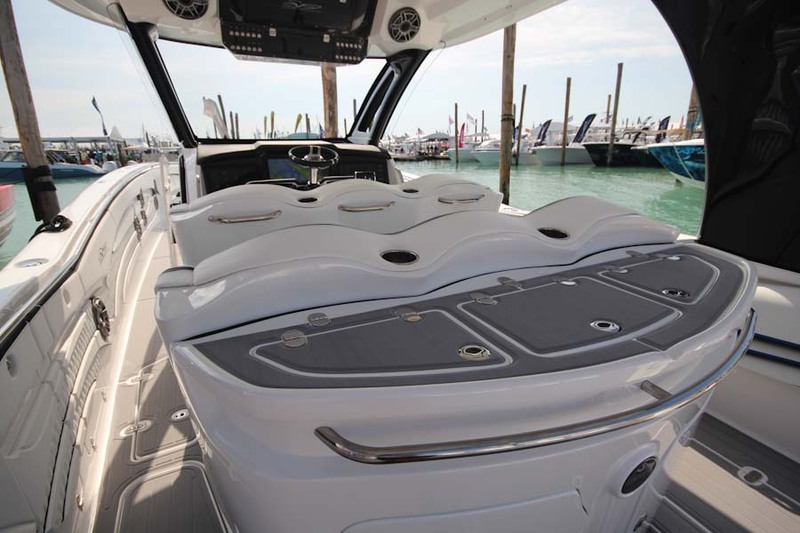 The patented “Slot V” hull offers a ride unlike anything else in the Vee Bottom world. 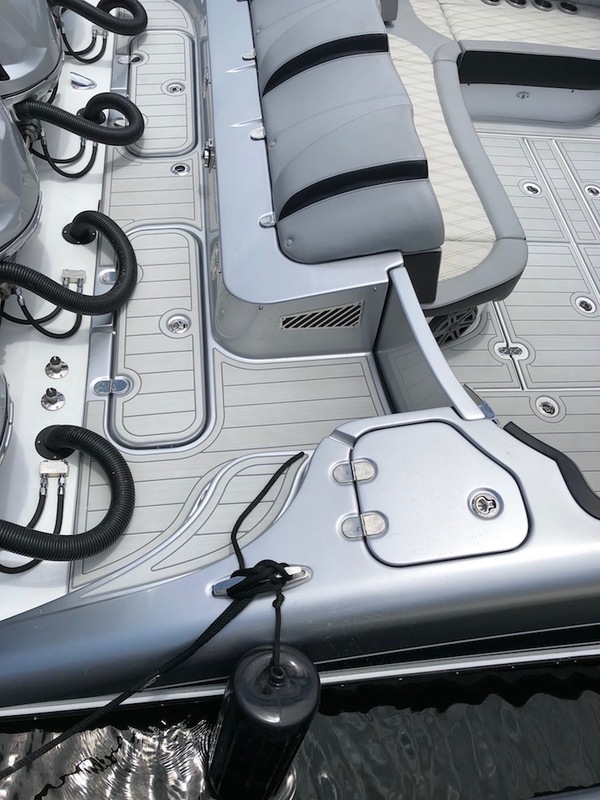 The hull design utilizes twin keels, similar to a catamaran, yielding straight, stable, and predictable handling at all speeds. 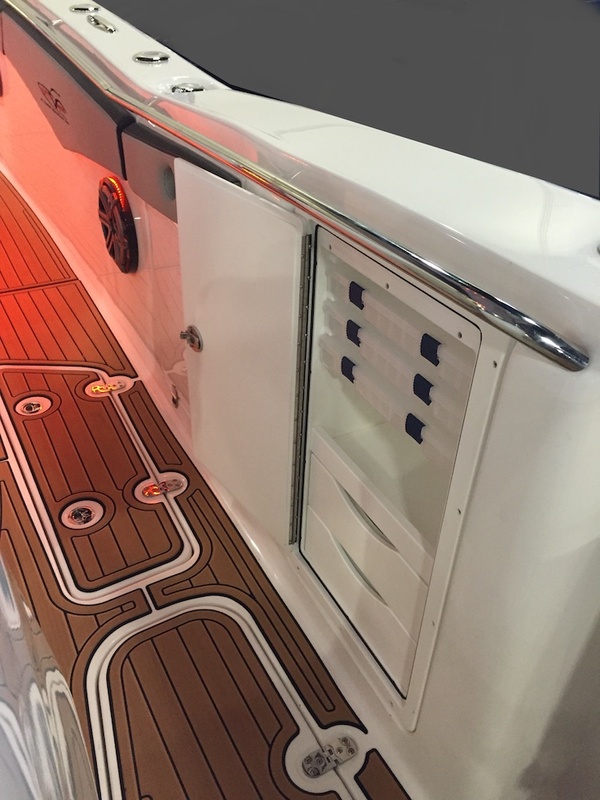 The step design also ventilates the hull and traps a boundary layer of air under the hull and between the twin keels. 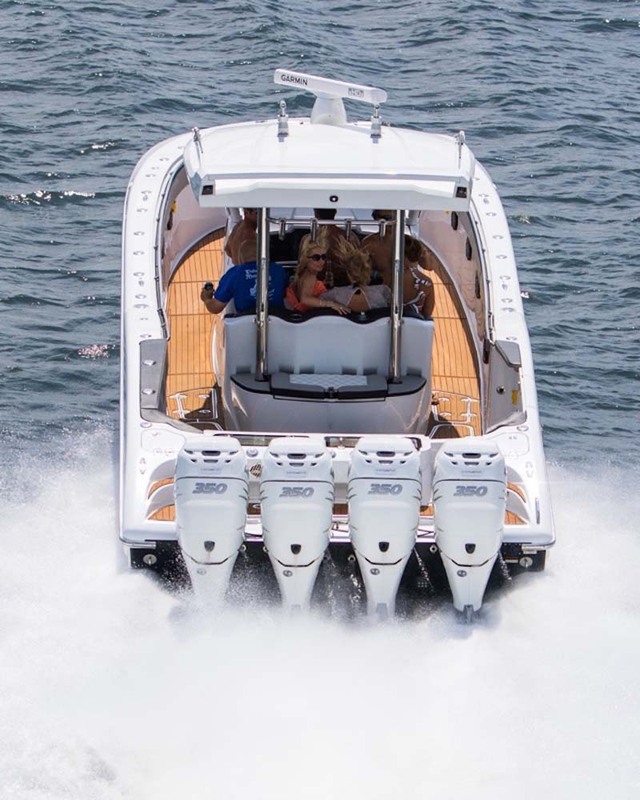 With the added bow flare, the MTI-V 42 is extremely dry riding even in extreme conditions in both head and following seas. 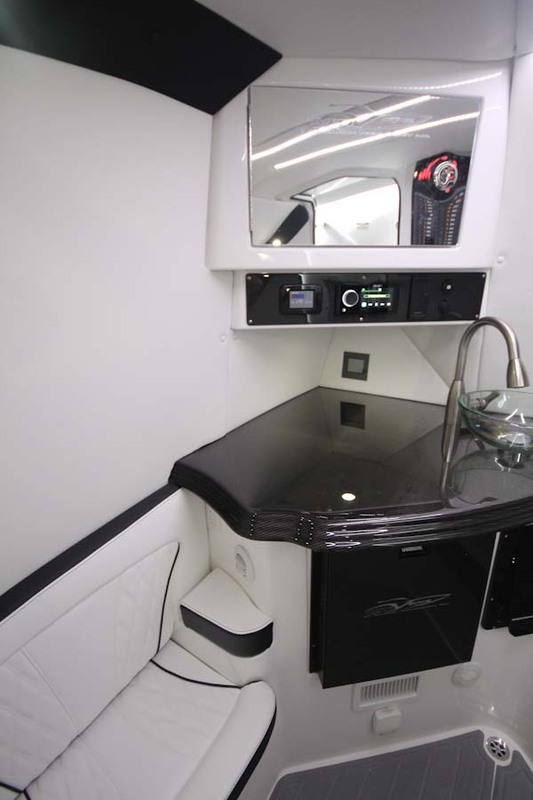 In the cockpit, the area above the central cabin has a front sun lounge that is one of the most comfortable seats on board. 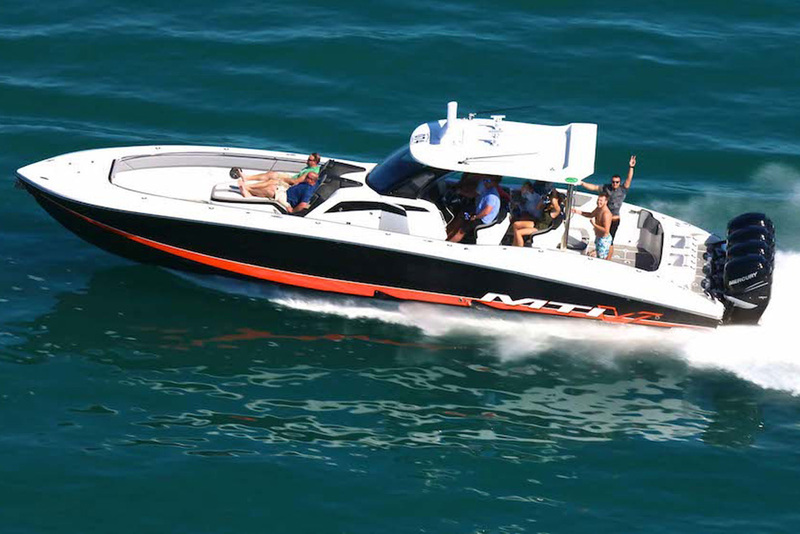 The contoured design cradles you comfortably and provides and extra feeling of security at cruising speeds. 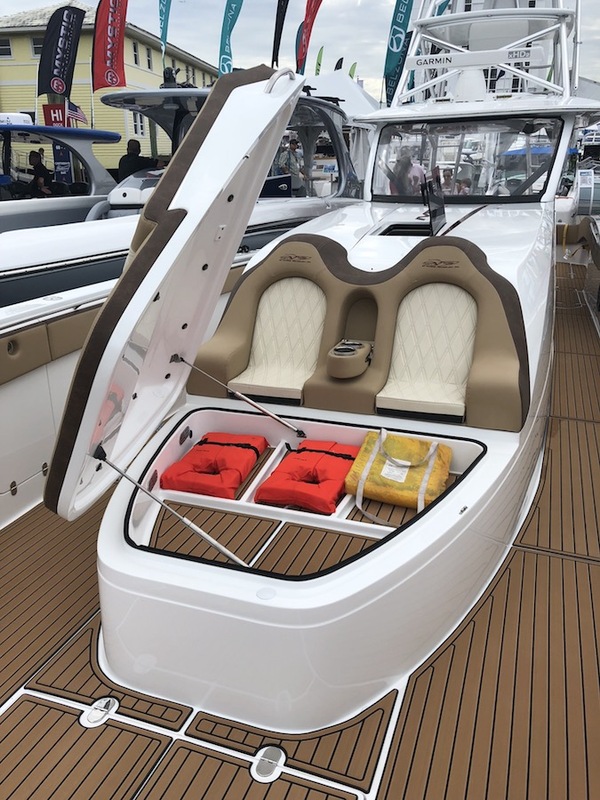 Moving forward there is U shaped bow seating. 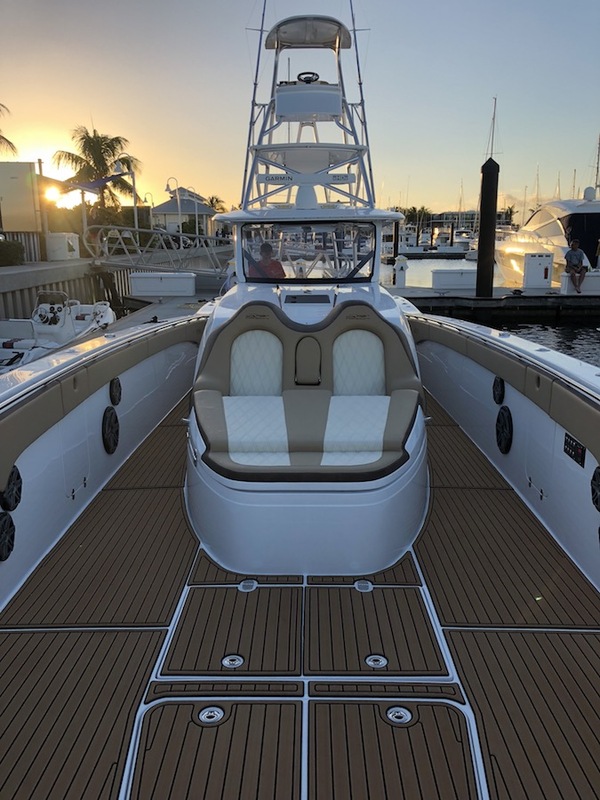 Behind the helm you’ll find two rows of 3 person stand up or sit downs bolsters while the unique hard top is large enough to cover both rows of seats. 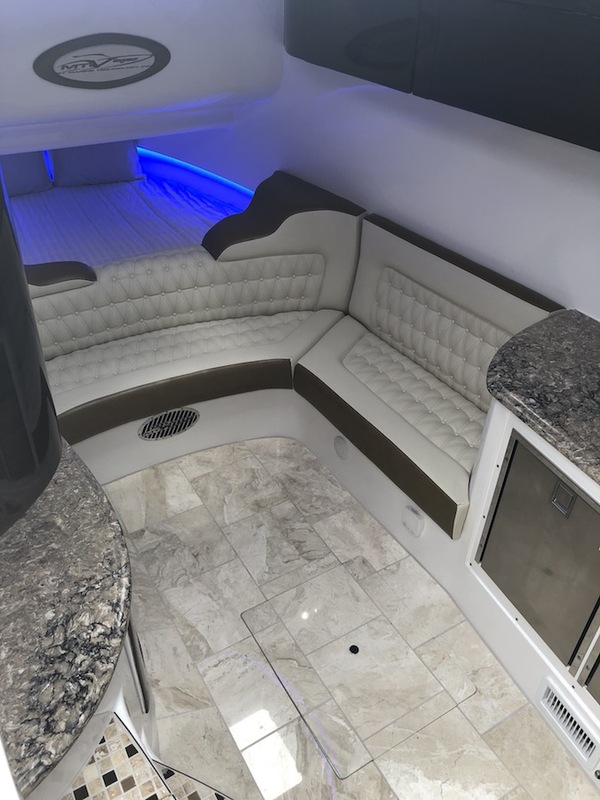 Going aft there’s a large rear bench. 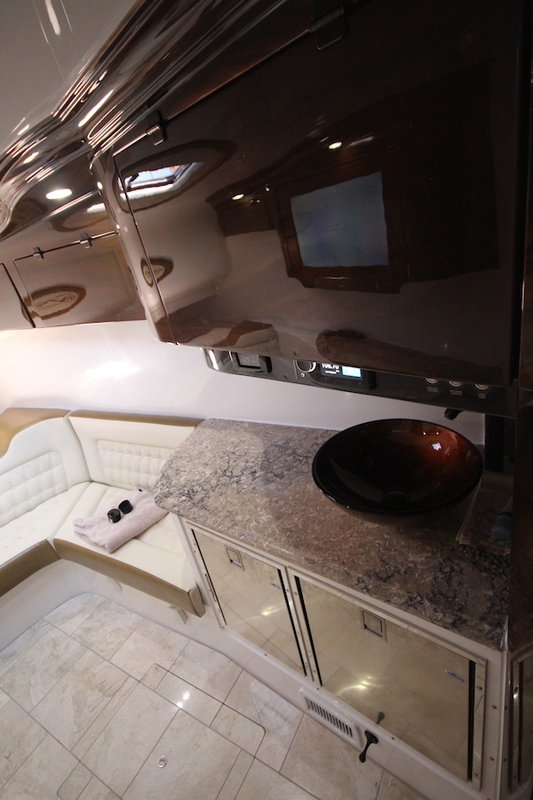 The cabin features a large forward berth with a comfortable mattress. 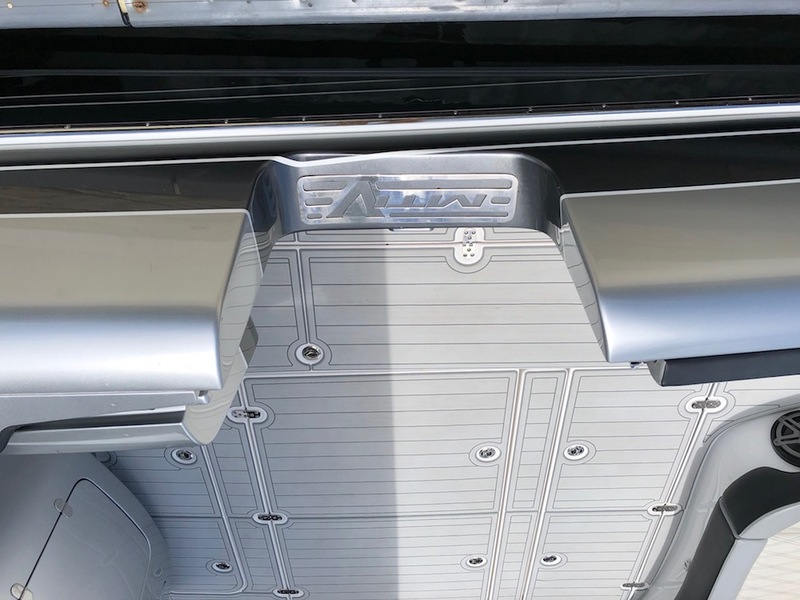 When not in use the rear of the bed folds up to create a limo style seat for riding or to escape the out of doors. 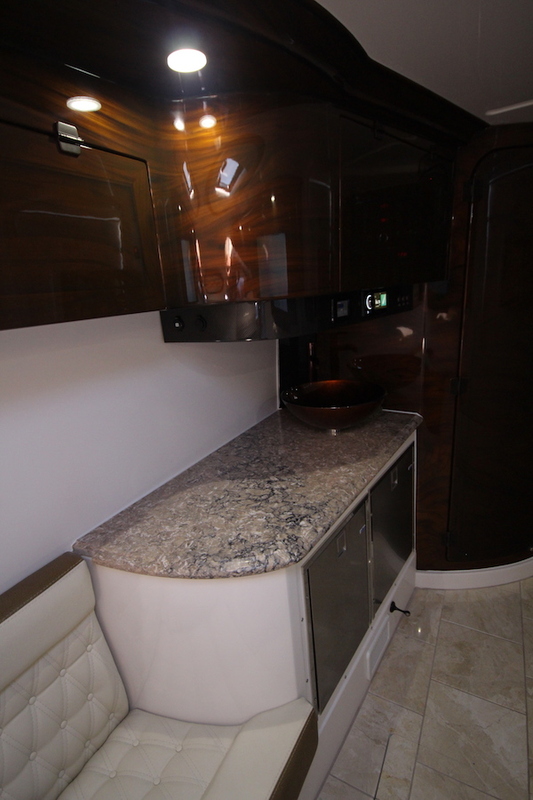 There’s a galley area and an electric flush head concealed below an additional seating area. 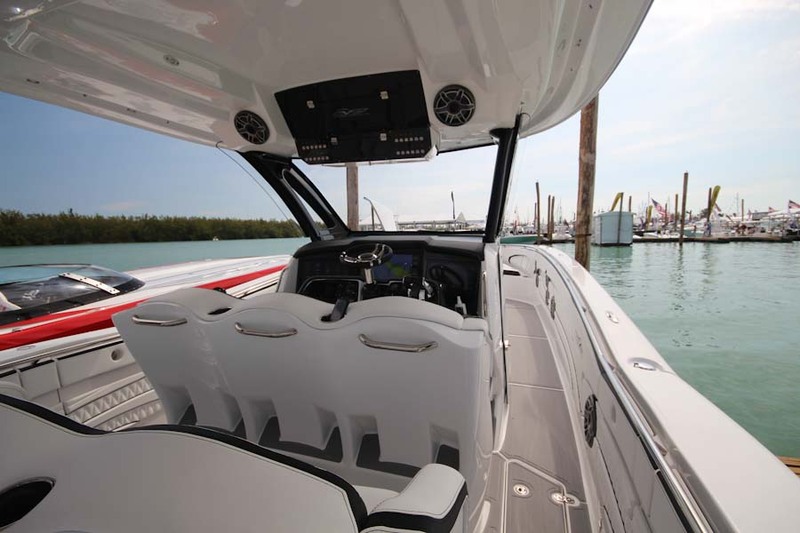 The 42 V comes with a long list of standard features, many of which are options found on other boats. 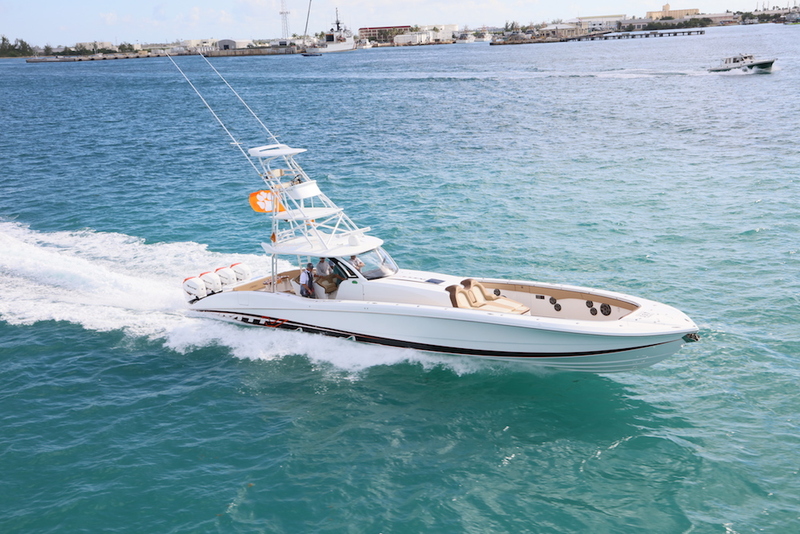 Every MTI is custom built to your specifications. 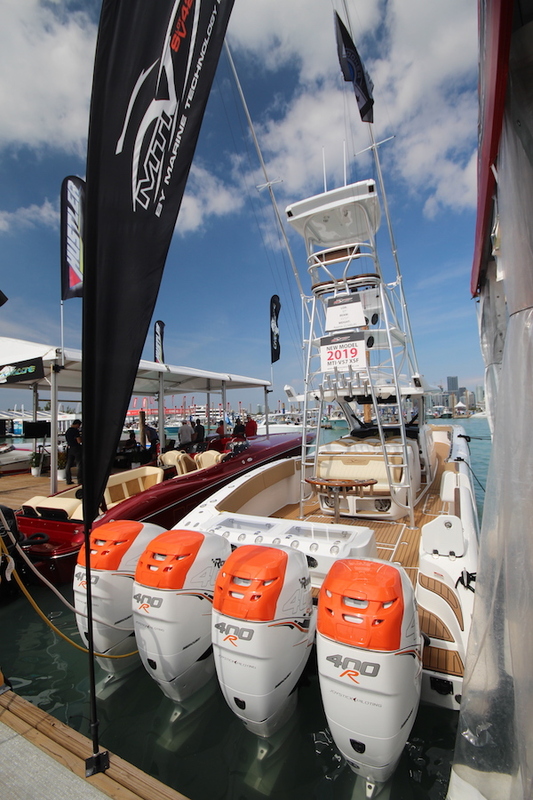 Starting with our available options, you can outfit the boat to your boating lifestyle. 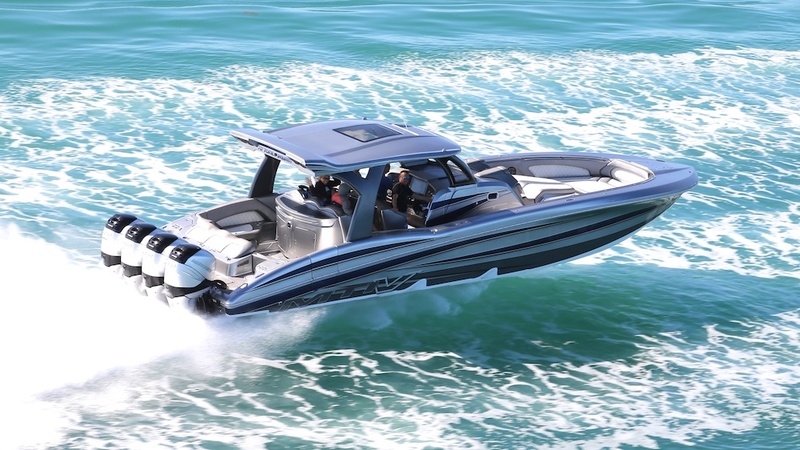 No matter how you boat or where, the MTI V can be tailored to meet or exceed your needs. 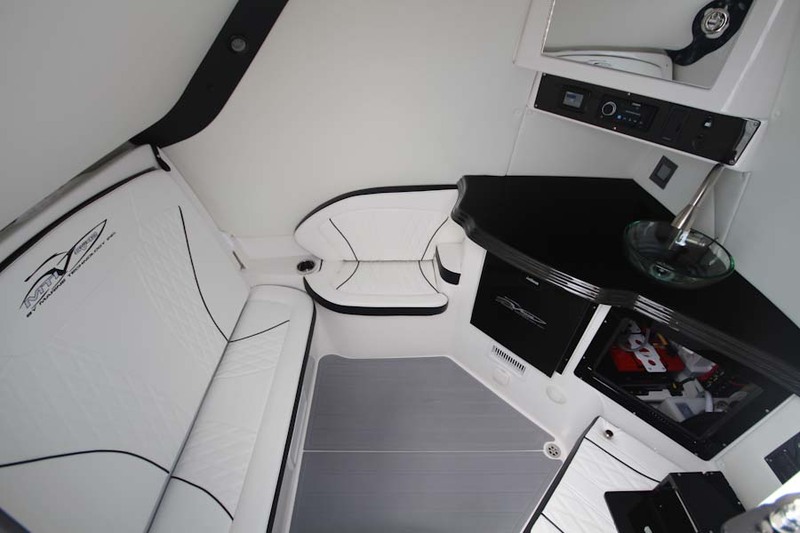 From there the exterior colors and graphics are only limited to your imagination. 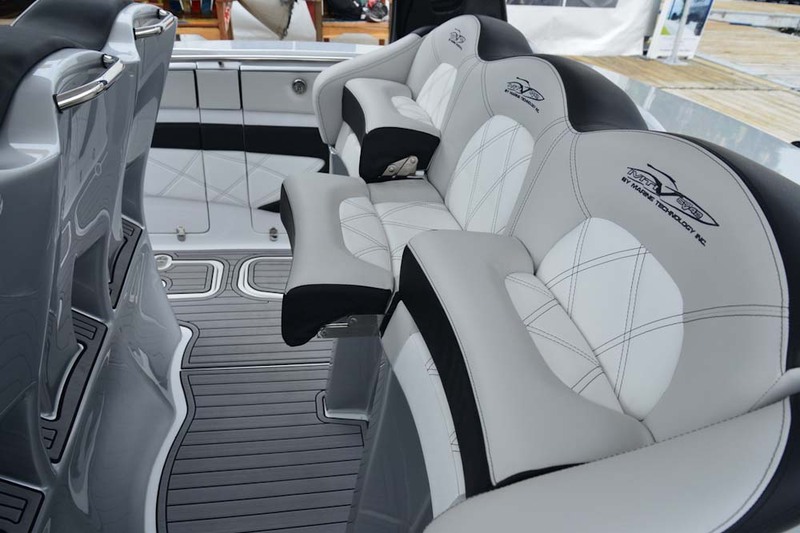 You can choose your interior seating options and fabrics from a wide array of the finest marine fabrics available. Our expert in-house designers are available to guide you through the entire process. E-Glass and Kevlar are the primary fabrics used. We also use carbon fiber on weight sensitive components, or even on the entire build if specified by our client. Strength comes from using the right materials with the right techniques in an engineered manner. 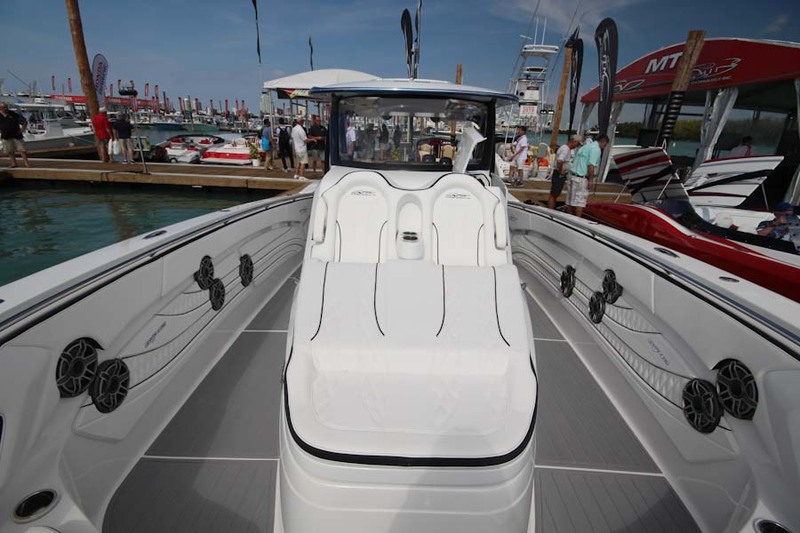 The MTI-V utilizes foam coring (no wood) in the hull bottom, sides, transom and stringers. 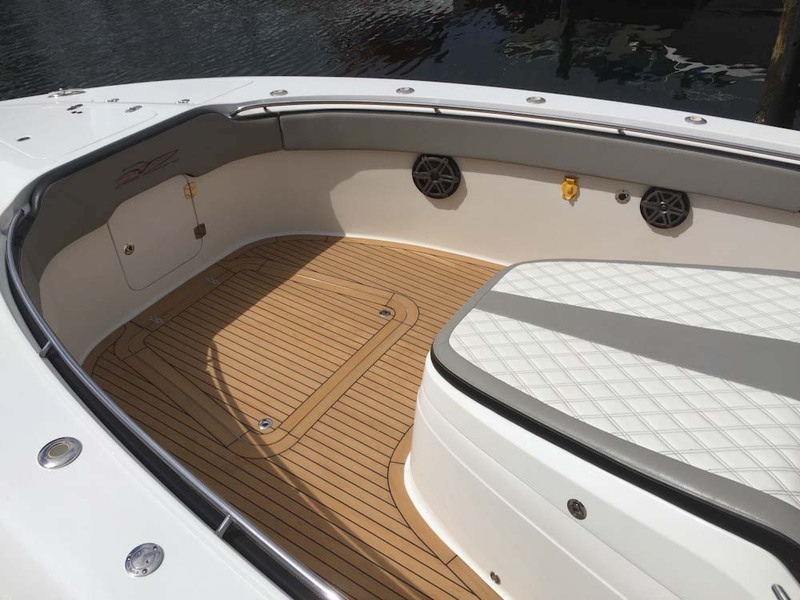 Many other boats are built minimal or even without core in the bottom. The cost of materials and labor are much higher with these techniques. 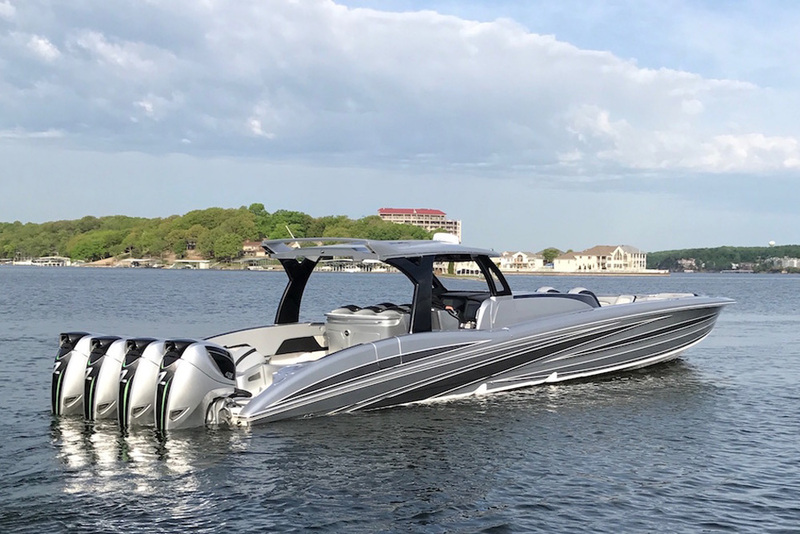 This may sound excessive for a pleasure boat application, but the result is a boat that is lighter, stronger, and faster. 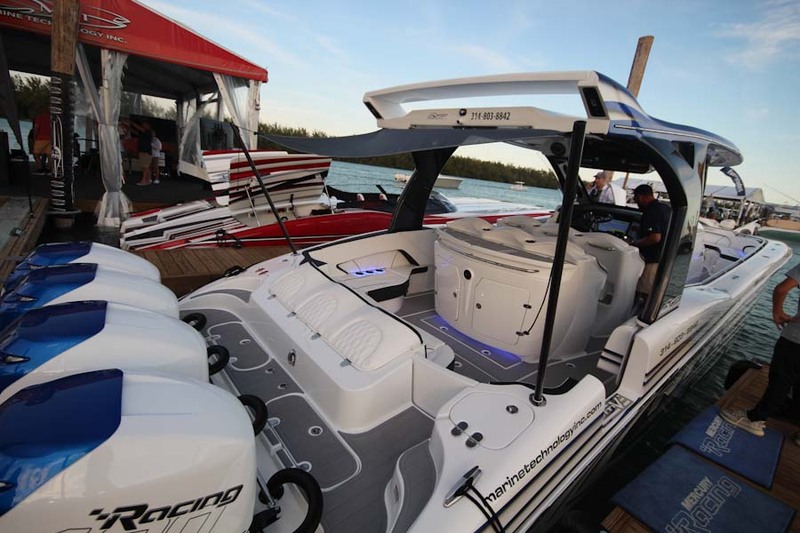 One test ride and you will feel the difference. 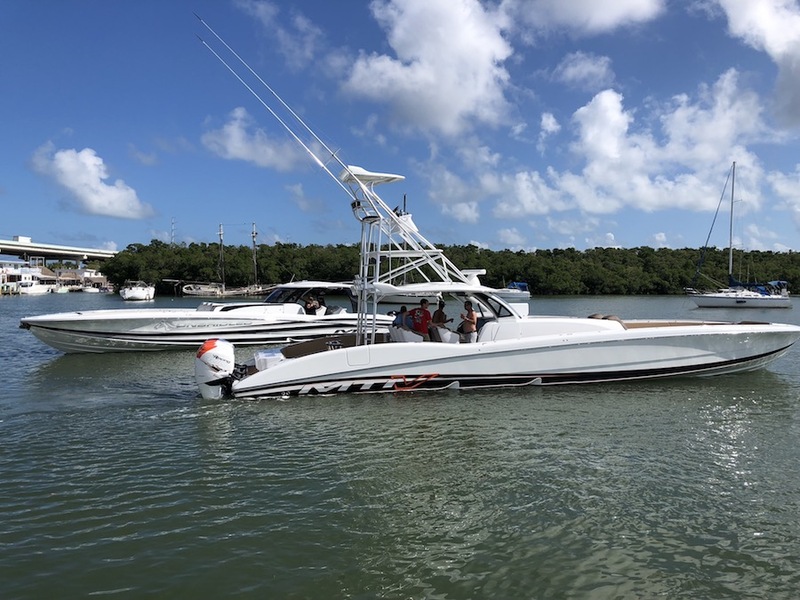 Custom Built MTI V-Bottom Boats The 42 V XSF Brings you all of the features and performance found in the pleasure version but geared more toward the serious angler. 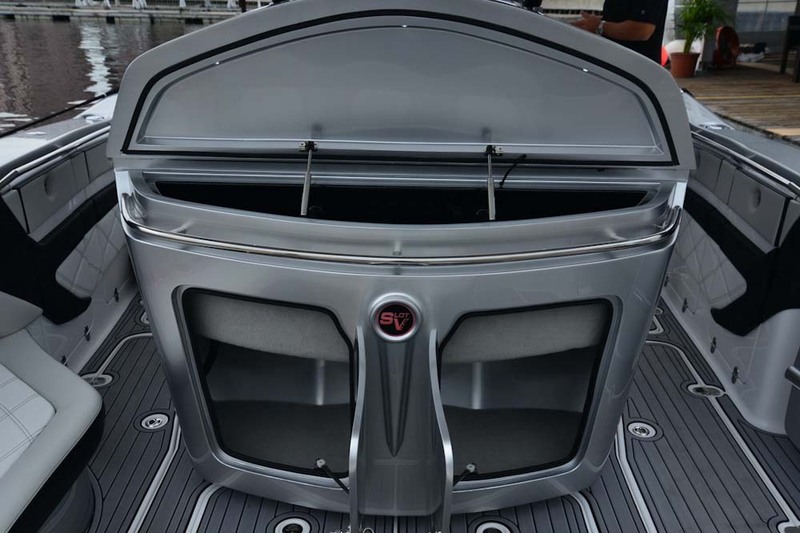 The T-top is shortened and outer legs relocated to center to allow more open fish fighting cockpit space. The rear bench has been removed to make room for the optional dual 45 gallon live wells. For even more fishing space, you can delete the forward bow seating. 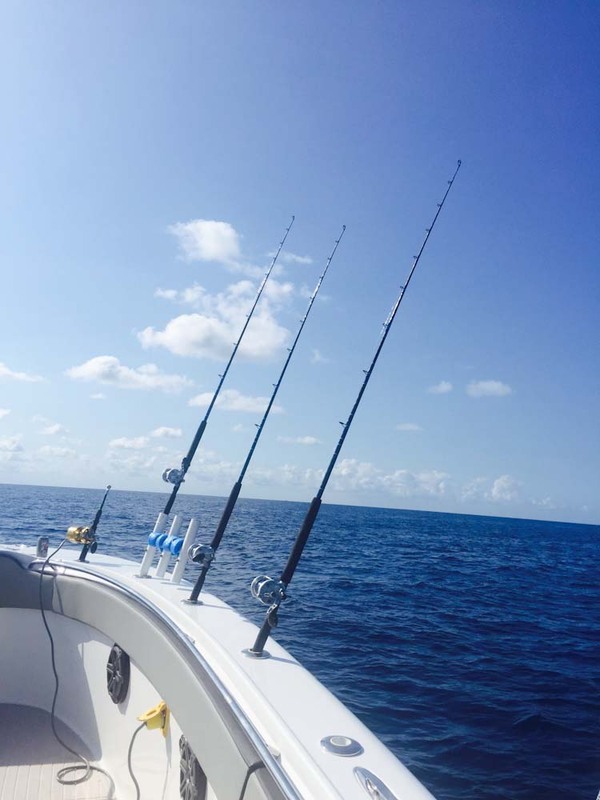 Bring us your list of ideas and we can build the ultimate offshore fishing platform for you. 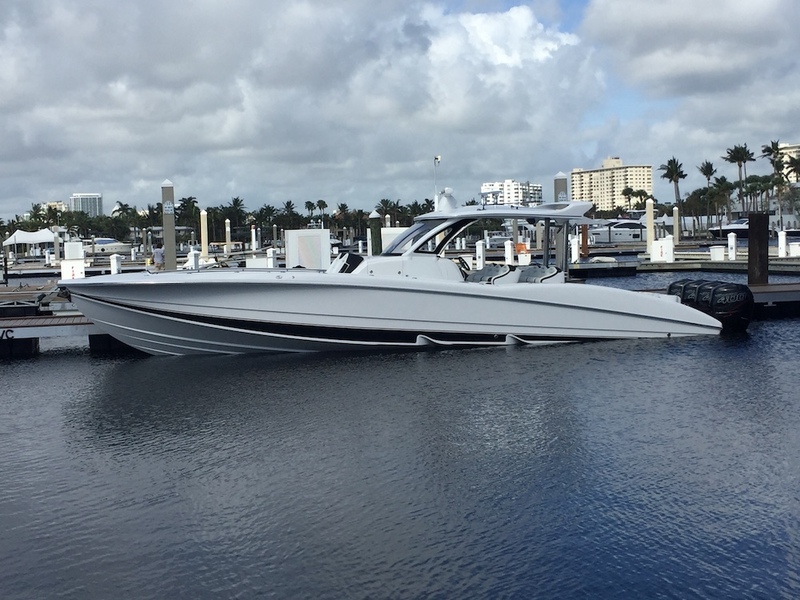 Thank you for your interest in Marine Technology Inc. We are committed to helping and serving our customers. Complete the form on this page and a member of our sales team will contact you in a timely manner. 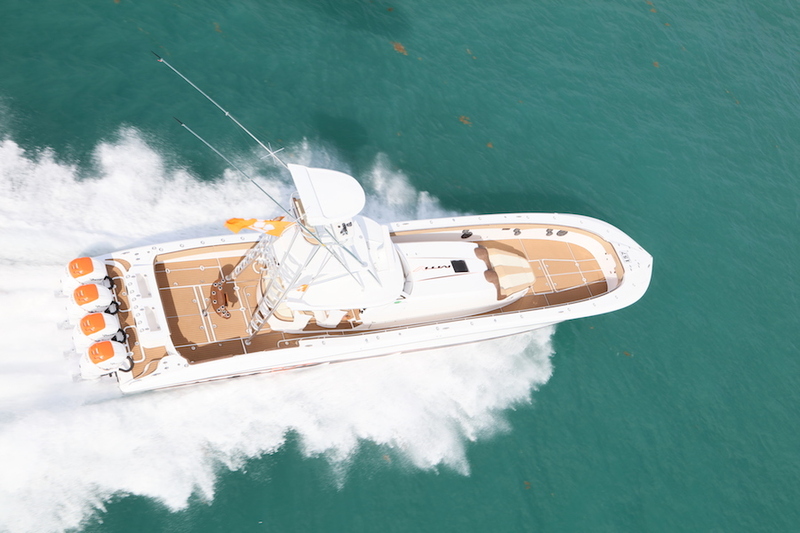 Feel free to contact us anytime for all of your high performance sales or service needs.